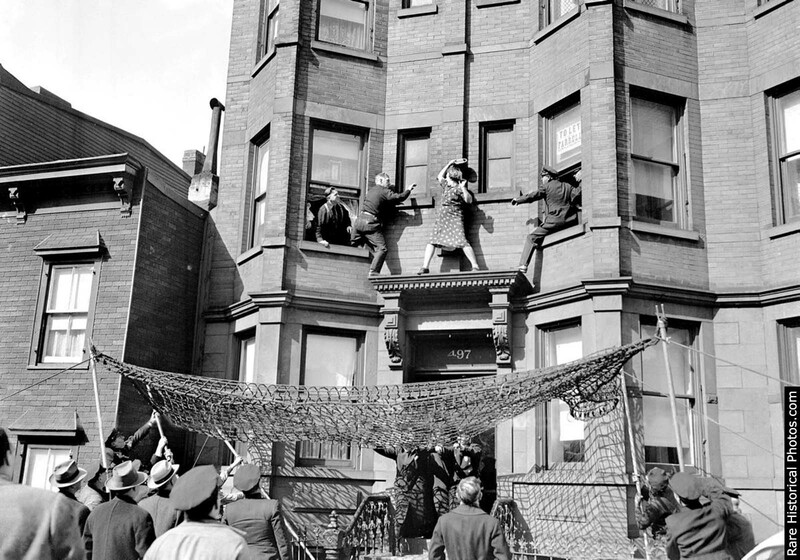 Edna Egbert fights with police as they try to prevent her from jumping off the second-story ledge of her home at 497 Dean Street in Brooklyn. The lady in the picture with the mirror held above her head – was Mrs. Edna Egbert. The photographer caught her in the ready-to-swing position, as a cop gets ready to dodge. The year was 1942 and Mrs. Egbert was living in the building at the time – No. 497 Dean Street. But what made Mrs. Egbert go out onto the ledge? She was clearly distraught – but why? Mrs. Egbert, apparently, had a reason. In the past, year her son, Fred, had gotten married, joined the army, and had not written to his mother a single time since. As any mother in this predicament would tell you, with the war raging on, she must have presumed her son was dead. So, out of frustration, nervousness, or fear, she climbed out onto her ledge and announced, “I’m going to jump!”. If you’re wondering how you could kill yourself from only the second floor, to either side of Ms. Egbert was a spiky iron fence that could have easily impaled her. While a crowd gathered on the street, one patrolman talked to Mrs. Egbert from the street while others rigged a net. As officers Ed Murphy and George Munday tried to persuade her to come back in to the building, she brandished a mirror and started swinging it at them. The police grabbed her arms and she proceeded to sit on the ledge. That is when they quickly pushed her into the net. The estimated 600 onlookers quickly dispersed and Mrs. Egbert was taken to Bellevue for observation. Officer grabs for Mrs. Egbert’s wrist. According to census records, Mrs. Egbert was either 42 or 44-years-old, not 50 as noted in every article about this story. Her husband John Egbert was 64 and their wayward son Fred was 20. Whatever became of Mrs. Egbert and her non-writing son Fred is unknown. The original caption on International News Photo reads: Three Cops and A Woman In Life and Death Drama. New York – Four of the five principal characters in today’s (March 19) life or death drama staged in a Brooklyn residential district. 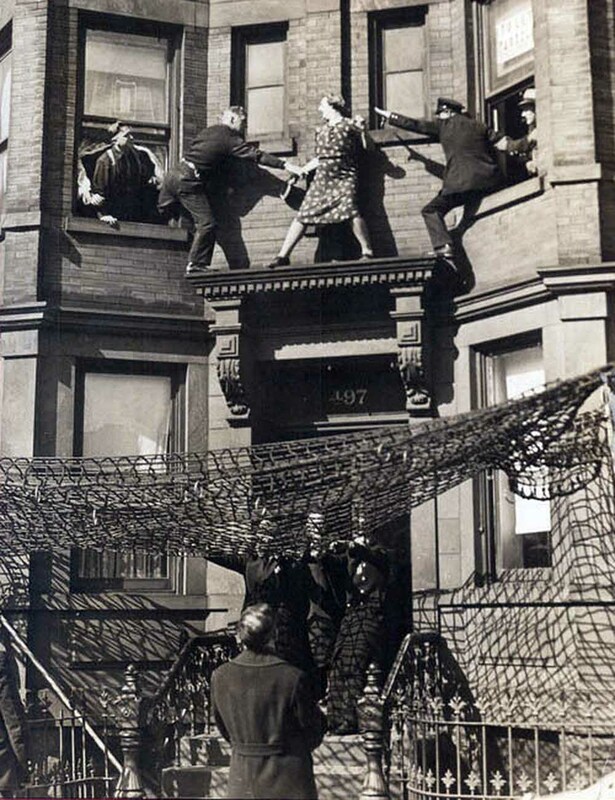 Mrs. Edna Egbert, 50, is shown on the 2nd story ledge of her apartment while three policemen flank her trying to talk her out of her threat to jump in a suicide attempt. Failing to dissuade the woman, the policemen pushed her from the ledge– into a large emergency net that had been rigged below. The fifth hero in this drama is the first policeman on the scene, who kept Mrs. Egbert on her ledge for 25 minutes while the net was being rigged. After attempting to get Mrs. Egbert to return to her house, she jumped. This picture is a screenshot from New York Post (March 20, 1942). (Photo credit: Charles Payne / Daily News). She was born Edna M Kinney on 20 Oct 1900 in Brooklyn, New York City, New York, United States d. of Charles Bamburgh and Effin Kinney. She married John Abraham Egbert on 24 Jun 1925 • New York City, New York, USA. She was the second wife of J A Egbert. Frederick J Egbert was born 1922 Brooklyn, New York. I belive he was still serviving in the Marine Corps under Army Number 1005688 - Jan 1946 • Marine Detachment, USS Oregon City, C/O Fleet Post Office, New York, New York. Needs more research! Poor woman...this is incredibly sad. I hope that she and her son ended up being all right.